General Co., Ltd., is one example that shows such commitment. What characterizes this business is a full-utilization recycling system, with used toner cartridges collected so that those that are reusable will be reworked and recycled, while those at the end of useful life are used as thermal energy sources or building/industrial materials for their most effective use. Recognized to be consistent with environmental protection policies proposed by government agencies such as the Ministry of Environment, this business is getting a great deal of attention as well as more and more support from various sectors of society. 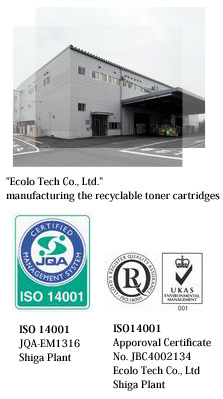 Shiga plant(General Co., Ltd.), the primary production site for General Group, and Ecolo Tech Co., Ltd., which manufactures recyclable cartridges, are facilities where maximum attention is paid to the surrounding environment. With their innovative facilities and capabilities, nearly 100% of the waste materials resulting from the production process are reused with waste fluid and dust collected and incinerated to keep them from leaking out. Shiga plant was certified in 2001, as was Ecolo Tech Co., Ltd. in 2005, as compliant with ISO14001, widely recognized as the world standard on environmental protection. We consider such proactive commitment to detoxification of production facilities as our mission to accomplish for the world we serve.